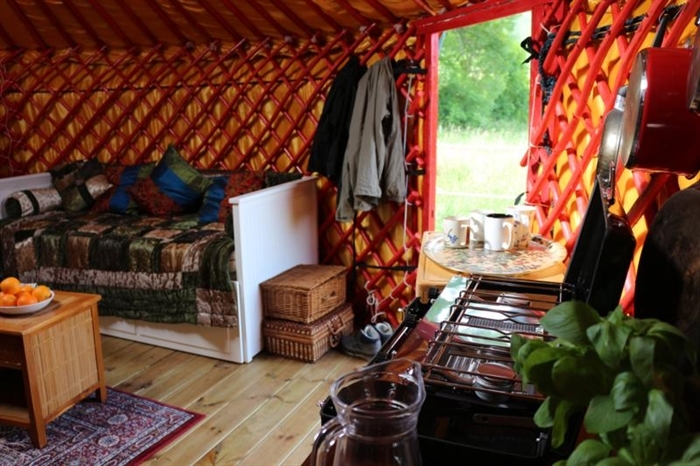 Gorgeous yurts, fabulous views, a breath of fresh air. 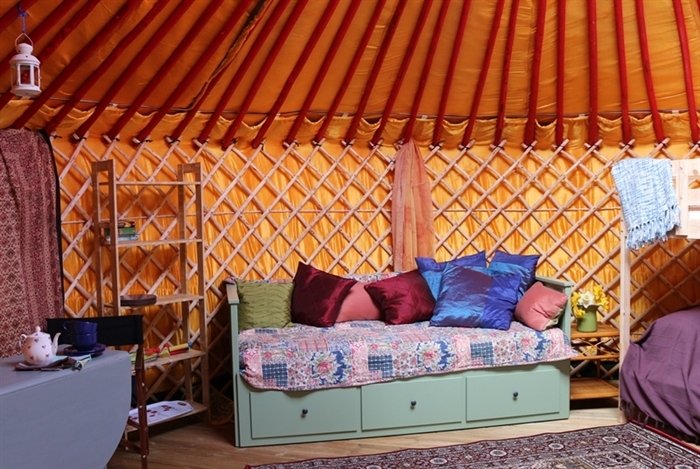 Glamping in style in the beautiful Ettrick Valley. Escape to another world for a few days and unwind in this small exclusive 'glampsite' in the Scottish Borders. 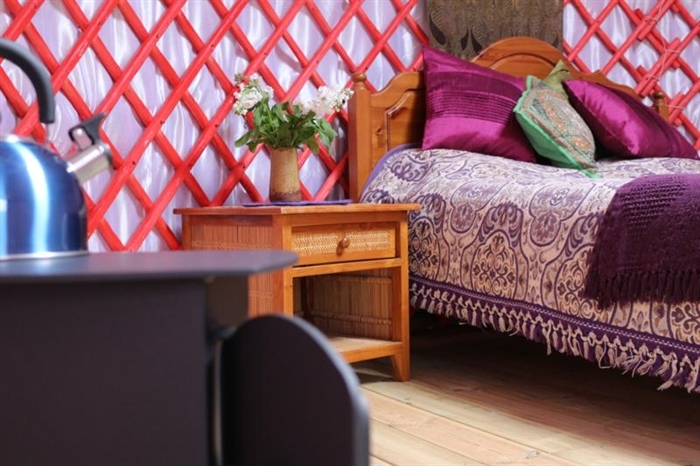 Small and exclusive ‘glamping’ site with gorgeous Mongolian yurts set in a beautiful Scottish Valley with stunning views. 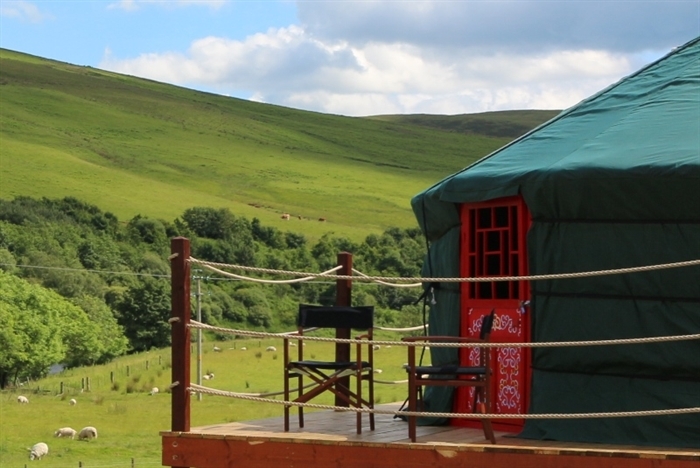 Our yurts are a natural forest green on the outside to blend in with the unspoilt Ettrick Valley. 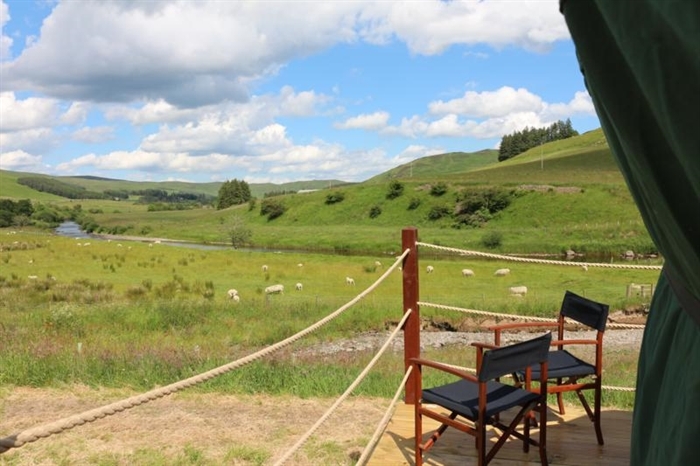 Each sits neatly on its own raised decking with panoramic views up or down the valley over the Ettrick Water and surrounding hills, and a private sitting out area right next to it with a picnic table, BBQ and fire pit. Colourful painted woodwork inside creates a wonderfully cosy atmosphere fabulously lit by the 5ft crown at the top during the day and candles and solar lights at night. Each is tastefully furnished with comfy beds to sleep up tp 6, table and chairs, duvets, fresh linens, cushions and extra blankets and has all the cooking equipment you will need for your stay. Colourful rugs keep your feet warm and a wood burning stove all set up for you to light on arrival will keep you toasty all night long. 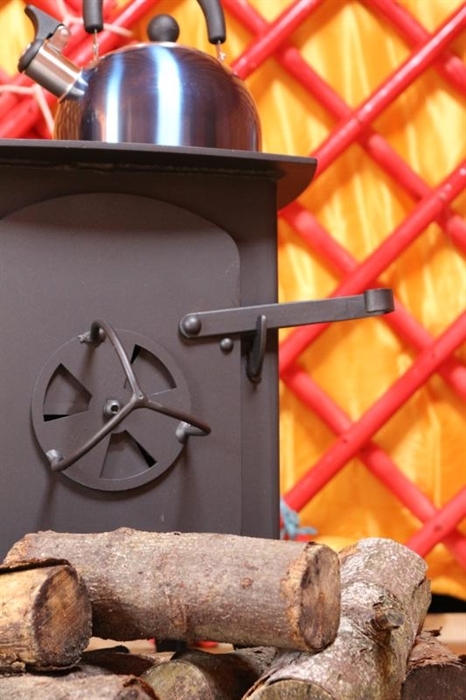 Hot showers and proper toilets are a short stroll from your Yurt, and we have a small honesty shop on site for any essentials you may have forgotten as well as a few little luxuries. There is also free Wi-Fi available and plenty of books and games you can borrow. The Newburgh Burn trickles through the site in summer and is a lovely place for paddling and messing about. 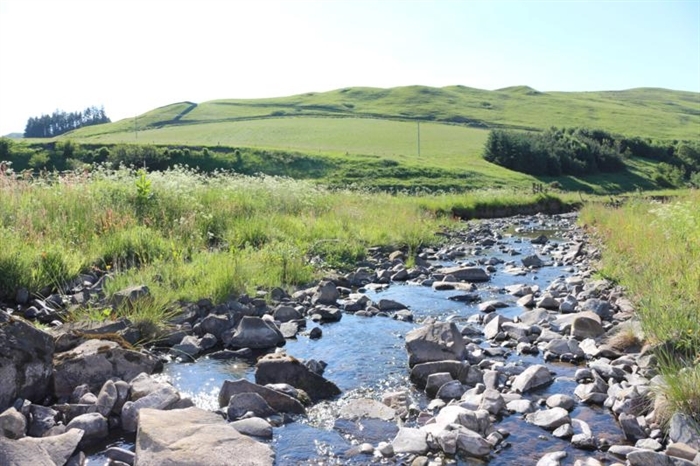 This flows into the River Ettrick which is securely fenced off but is easily accessed. 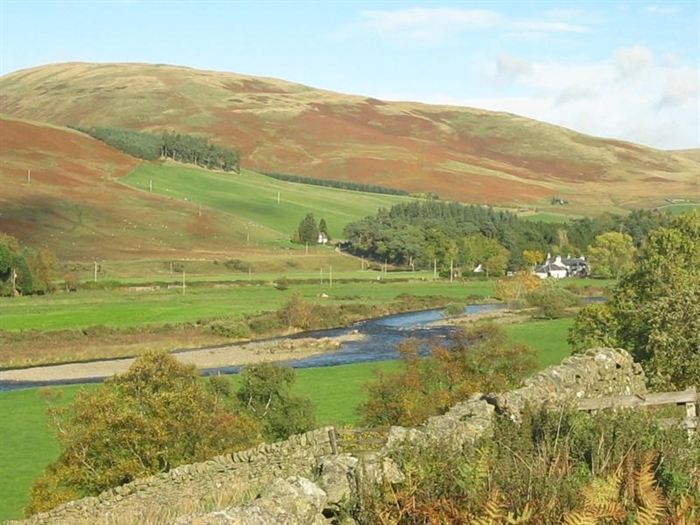 Lovely rolling hills, sparkly streams and gently meandering rivers define the Ettrick valley and its neighbour the Yarrow Valley – covering a large area from Selkirk to Moffat with some of the finest scenery in Scotland. Even though you are only 70 minutes from the City of Edinburgh, such is the remote and tranquil feel of these beautiful valleys, you could be hours from anywhere. Fresh air and wildlife abound here and there is no light pollution so thousands of stars are visible on a clear night. You can walk the hills close by or follow one of the several walks of varied difficulty outlined in an excellent guide we have for the valleys. 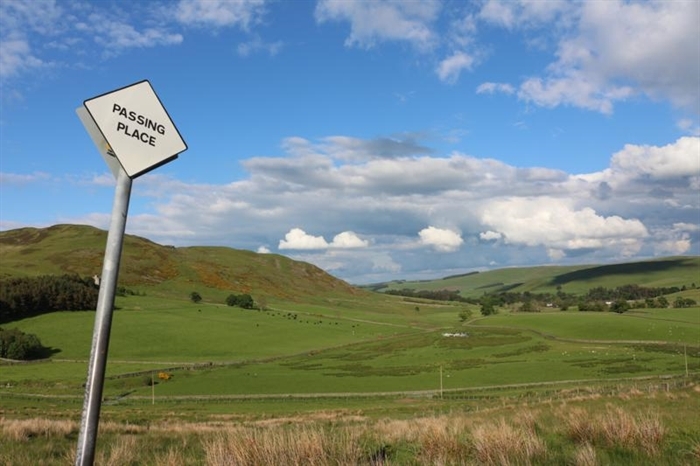 If you are keen cyclists then please do bring your bikes as the roads here were made for cycling with several routes mapped out, and are often used by national and local bike races such as the Tour o’ the Borders. For off road biking then the internationally renowned 7 Stanes courses at Glentress and Innerleithen are a great day out where bikes can be hired. We have several local pubs a short drive from the site (or a slightly longer cycle). All are very welcoming and friendly and serve great food and drinks, sometimes with live music. 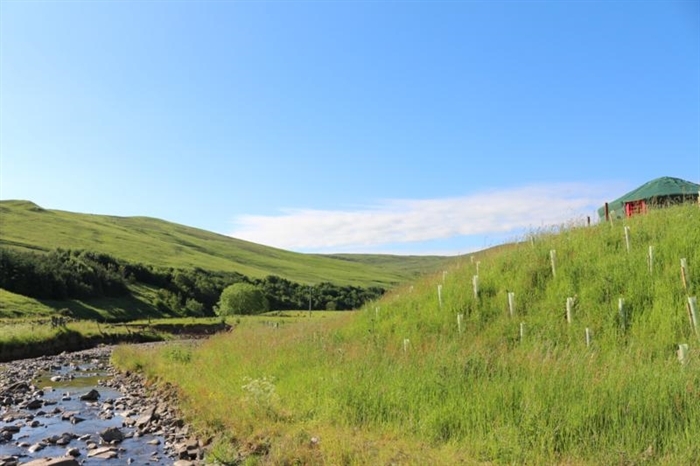 The Ettrick Valley is also a wonderful base for exploring the Scottish Borders with its rich cultural and historic heritage, and natural wonders such as the Grey Mare's Tail waterfall and St Mary’s Loch. 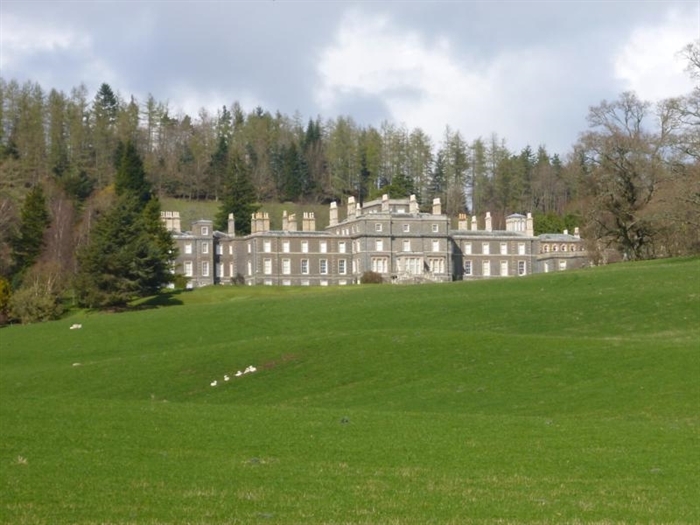 The area is steeped in history and in the area are several attractions in the form of country houses such as Bowhill, Abbotsford and Traquair; castles such as Neidpath, Floors and Thirelstane; the ruined abbeys of Melrose, Dryburgh, and Kelso; and pretty Border towns like Peebles, Melrose, and Newton St Boswells to name a few with all their shops, galleries, cafes and restaurants. And then there opportunities for golf, horse riding, kayaking, tree climbing at Go Ape and many other attractions close enough for a day out – even a trip into Edinburgh. All in all there is plenty to do although you might just want to enjoy the miles and miles of unspoilt countryside, still wild and inspiring, which makes the Ettrick valley so special and just relax, toast marshmallows and gaze at the stars. Please see our website or contact us directly for more information.